Below you will find many fresh escarole recipes (how does pizza sound?). My recipes range from delicious homemade soups, and casseroles from scratch - to tasty combinations of beans or sausage below. First things first: when cleaning, it is a good idea to throw out the bottoms. You should not throw the white parts of escarole out, because they are the least bitter parts. Escarole is best after the first frost of the season. Before that you seldom see any white parts (thanks Angela for the tip). When any of the recipes call for an ounce of escarole - just remember 1 cup = 1 ounce. This escarole recipe has bacon in it and is very tasty. Place bacon in a large skillet and fry until crisp. Remove and drain on paper towels. In the same skillet with bacon grease add the olive oil and heat for a minute. Add the escarole and cook for 3-4 minutes. Add the garlic and stir. Next comes the chicken broth and beans - you will want to season to your taste with the red pepper flakes, salt and pepper. Ladle the soup into bowls and add some crumbled bacon and grated parmesan cheese on top. Serve with a slice of buttered crusty bread to dip into the juice. In a large pot with salted water, boil the escarole until tender and wilted; approximately 5 minutes. Drain and set aside. Place the olive oil in a skillet and heat. Add the chopped prosciutto and cook until just rendered; about 2 minutes. Add the garlic and saute for a minute or two. Next add the hot peppers and cook for another two minutes. Then add the drained escarole to the skillet with the chicken broth and 1/4 cup of Romano cheese. PREHEAT your broiler and lightly spray a casserole dish. Toss the bread crumbs and the remaining 1/4 cup of the cheese together in a small bowl. Pour the escarole into the prepared dish and top with the bread crumb mixture. Broil for 3-5 minutes or until the topping is lightly brown and serve immediately. This escarole recipe is comfort food at it's best. Roll the Italian bulk sausage into mini "meatballs" and fry with olive oil in a large pot. Add the garlic and onion and cook until meatballs are no longer pink in the middle; about 10 minutes or so. Meanwhile, bring a pot of salted water to a boil and cook the pasta according to directions. Drain and add to the mini meatballs. Pour in the chicken broth, cannelloni beans, chopped escarole, drained pasta and tomato sauce. Simmer for 45-60 minutes and serve with a crusty slice of buttered bread. For this escarole recipe, add some chicken and make this a meal. In a large salad bowl, combine the 3 types of lettuce with the tomatoes and black olives; lightly toss. In a bowl, whisk together the vinegar, sugar, olive oil, garlic, lemon juice, chicken broth and parmesan cheese. Season with salt and pepper and whisk until all is combined. Pour dressing over the salad, toss and serve. This escarole recipe is a little time consuming, but so worth it. If you can get pizza dough from a pizzeria or supermarket - go for it, this will save a lot of time. This pizza can be served right out of the oven or cold. Cut the bottom off the escarole heads and then cut them in half. Bring a pot of salted water to a boil and cook escarole until tender - approximately 20 minutes. If the escarole is bitter; add the white sugar. Drain and squeeze out water. Set aside. In a heated heavy skillet, add the olive oil until hot. Add the garlic slices next and then saute the drained escarole. Sprinkle with red pepper flakes to taste. Add the sliced olives and heat through. Drain this mixture well. PREHEAT the oven to 400 degrees and use 1/2 of the melted butter to grease a deep dish pizza pan if you have one. We need a pan with sides. Place 1/2 of the rolled out dough in the pizza pan and make sure the dough comes up the sides. Place the escarole mixture on the bottom crust and place the other half of the rolled out dough on top. Pinch the seams together tightly and brush with some of the remaining melted butter. Make some fork holes on top for ventilation. Bake for 15 minutes and then reduce heat to 350 degrees and bake for another 30 minutes or until golden brown. Brush top crust with melted butter before serving. In a large skillet, heat the canola oil and fry the sausage (crumbling with a spoon) and chopped onion until the sausage is cooked and onion is tender. Stir in the potatoes, wine, garlic, beans and chicken broth. Cover and simmer for 8 minutes. Add the escarole and rosemary. Cook for 4-5 minutes or until the escarole is wilted. 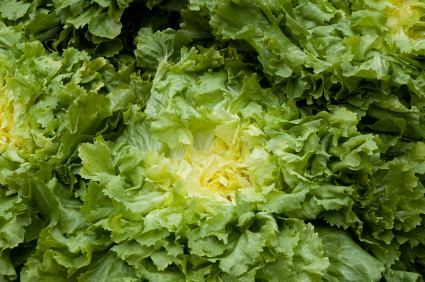 If you are looking for a specific escarole recipe, please send me a quick note and I'll try to get it to you right away.